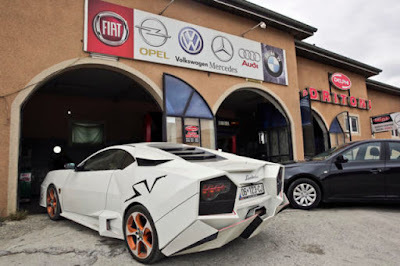 When the Lamborghini name is called, usually catched directly in our mind is an Italian made super-luxury cars and then it could be changed until you see the work of a car modification enthusiast of Kosovo. Yes, his name Driton Selmani, a Kosovan modification enthusiast as well as the owner of a car repair shop in the town of Gjilan, Kosovo. He managed to assemble a rare replica of the Lamborghini Reventon by using the Mitsubishi used cars. To assemble the replica of Lamborghini Reventon, Selmani was used the chassis of Mitsubishi Eclipse. While for the engine, he using a 3,000 cc V6 engine of Mitsubishi Galant. As is well known, that the original Reventon driven by using a V12 engine capacity of 6.5 liters and can be driven up to a maximum speed of 355.6 km/h. Might be those speed numbers could not be reach by the Selmani's replica car. 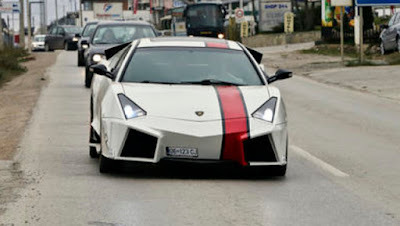 As quoted of FoxNews, Selmani also install several features such as Lambo's scissor door type and a number of other details that make the car really looks like a Lamborghini. It has took about a year to assemble this dream car and spent the money about US. $35,000 or about Rp.474 million. Those numbers was far away compared to the price of real Lamborghini Reventon is sold at a price of $1.5 million or approximately Rp.20,3 billion.